It’s been hard getting into the Christmas groove, in large part due to the fact that it’s been in the 50s here in Utah. As in, I even open my window from time to time. I was looking at photos from this time last year. Hello snow and cold. It definitely felt like Christmas with the proper weather. And I always find it fascinating for those that have sunny weather at this time of year or all my friends ‘down under’ where Santa can be found in bermuda shorts. At this rate, our Santa will be in the same attire in this neck of the woods. We still have a couple weeks to dream of a white Christmas. Hopefully it will happen soon. In the meantime, I think we are dreaming here today with some real snow of the paper kind. Like from a fabulous new friend that’s visiting for the holidays. Everyone say hello to Paige Evans! So let’s see what ‘wintery weather’ Paige has brought to us today! When I saw this page I was in awe. I would never have thought to create a middle section of snowflakes using the December Additions Pages. And backed with that fun paper? When I saw these snowflakes I immediately knew what I wanted to create! And then when I was picking a collection to use I saw the Brighton Pier collection by Studio Calico and thought it’d be fun to branch out from the traditional red and green. Die cut the snowflake background found in the December Additions: The Pages from white cardstock using your digital craft cutter (I have a Silhouette Cameo). Back the open spaces of the snowflakes with colorful papers from the Brighton Pier collection by Studio Calico. 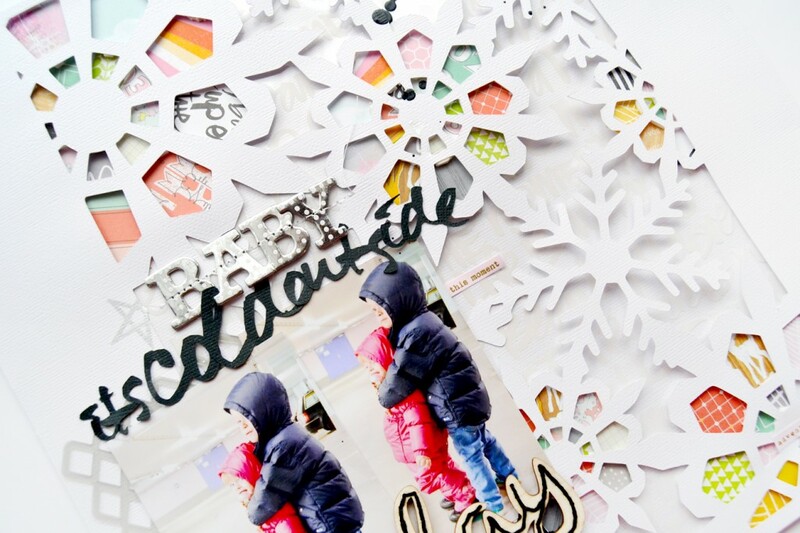 Back the layout with a white patterned transparency followed by white cardstock and staple a few of the snowflakes in the center. Adhere two photos on the left side and tuck a mask under the edge. Stitch through a wood veneer word with black floss and place it under the photos. Die cut the “Baby it’s cold outside” phrase found in the Black+White Christmas set from black cardstock and glue just the “it’s cold outside” above the photos. Stitch silver foil Thickers at the top to complete the title. Place a few pink sentiment stickers around the layout and apply a few silver star rub ons as well. Journal on the top right corner with a black pen and stamp the date below in black ink. Drop black India ink around the layout to finish. Journaling reads: It’s so fun to see Fox be the protective big brother. When Jane ran away in the parking lot Fox immediately went after her and hugged her until we could grab her. I’m dying to make a page like that now! Thanks so much for visiting us here at KBS for the holidays Paige. It was so much fun having you here. I thought it only appropriate to bring you this little lacy number today. This is no longer available as a freebie, but you can get it in the store HERE. The winner of the Tallulah Boutique fingerprint necklace is SueinMtVernon. I have emailed you, so keep an eye out for it. That is a cute page! Great idea with the snowflakes as a background! Thank you for the lovely freebies! Thanks so much for the great tutorial Paige & to Kerri for introducing us! Love the snowflake Kerri! I just do not have the ability to think outside the box like that. I SO wish I could. I LOVE that page but never would have envisioned that when looking at that set! When I see clever things like that it always make me wonder what else I’m missing. Love the snowflake, thank you! I love snowflakes (most likely because I live where it never snows!) … so thank you for today’s gift; beautiful!! That layout is too awesome! I really have to get a Silhouette and your classes soon!! Thanks for today’s freebie! Love the cute page too! Thanks Kerri for the beautifully lacy snowflake. It might be the only kind we get here in Tennessee this Christmas season! 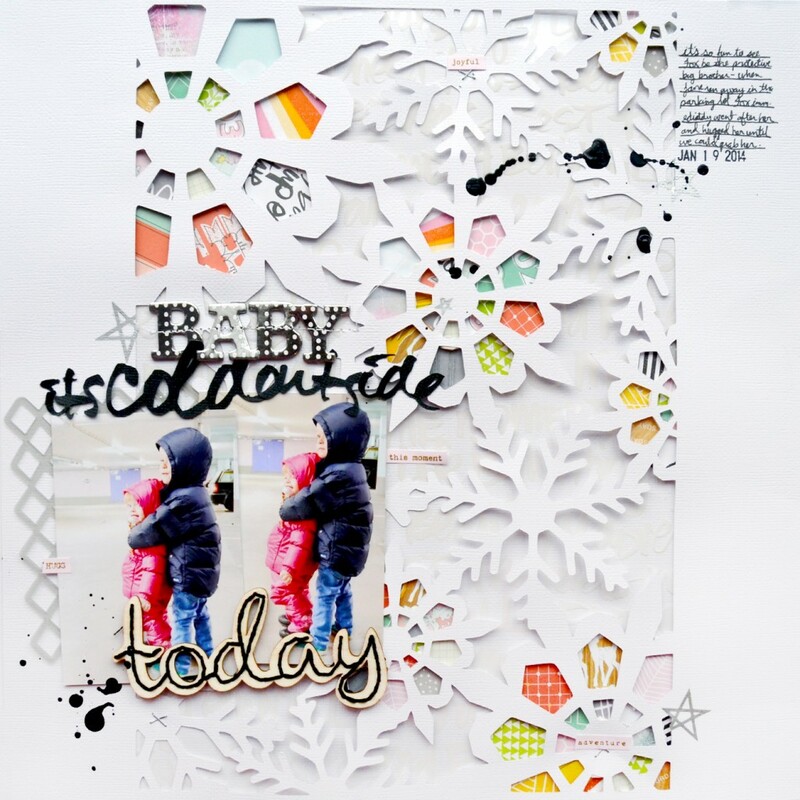 Those precious little ones on Paige’s page are perfect with your beautiful cut files! adorable! Thank you for the snowflake and the cool idea for using it. Ahh I’m thinking cool Christmas looking at this sweet LO! 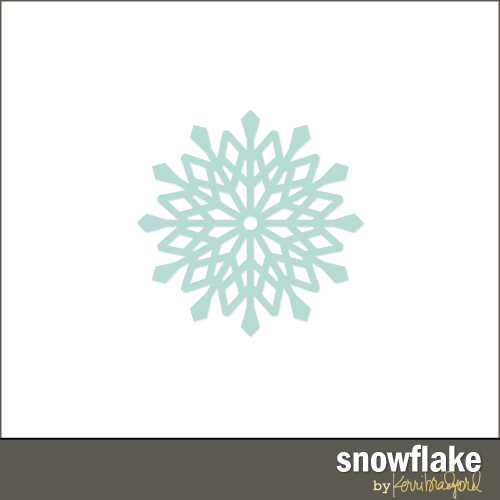 Thanks for the beautiful snowflake Kerri! My dad gave a HUGE HUGE weather balloon to my brothers and me. It took forever to blow up but was so fun. I have no idea where he got it.